We can't thank Marco enough for a lovely week in Liguria. The house is really secluded, amidst trees on a hillside at the end of a lane, and has everything you need. We hung out as a family by the pool most days, which was beautifully clean and well kept and played lots of tabletennis. The veranda was perfect for eating in the evening and it was so nice to be surrounded by trees and bird life. So relaxing and just what we needed. The local restaurant does great pizza too and we enjoyed meals out in Chiavari and further down the coast, Santa Margarita. This villa is nothing short of perfect. Its location in a deep, green valley is spectacular; the narrow winding access road is a bonus not a deterrent as it makes the property very private. Lovely surroundings of beautiful trees and olive groves; kitchen garden with fresh herbs at the back door. The house is charming, very well maintained and very clean. It is also large enough to be ideal for our small family reunion. The swimming pool and the many terraces add hugely to the enjoyment. We were looked after by the owner from our arrival and throughout our three week stay. The town of Chiavari is a wonderfully authentic and stylish and became our favourite spot on the coast. From Genoa, to Milan through to Tuscany, every place you might want to visit is easily accessible by car and train. And the house cat was a wonderful addition to the easy ambiance of the place. We are looking forward to our return and give this villa the highest possible recommendation. "Delightful surroundings with a view to the hill and valley and see, green and flowers everywhere, enjoyable swimming pool and functional facilities; in addition the whole Ligurian coast with most charming little and bigger towns and villages - all what is needed for the amenity of staying." 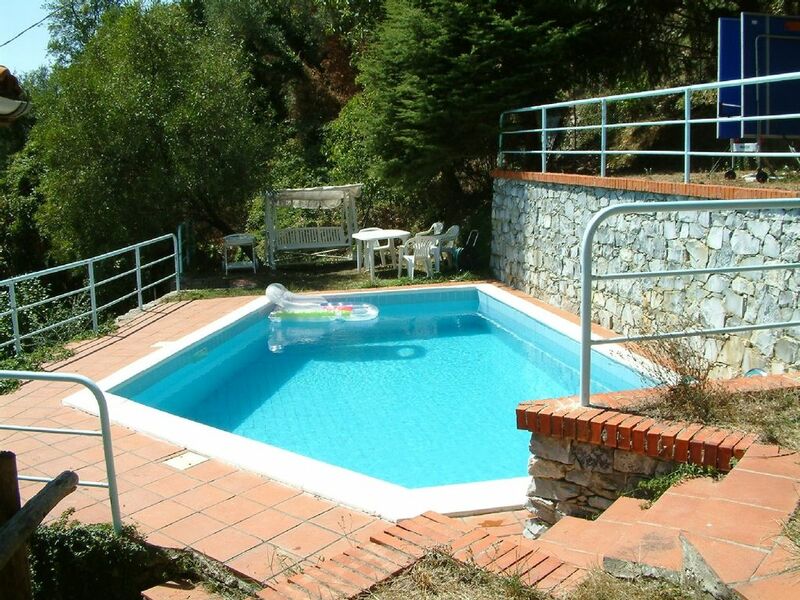 "Well appointed house in beautiful, secluded and peaceful surroundings overlooking Chiavari. Excellent pool, table tennis, loungers. Ideal for a relaxing family holiday. Many great and historic places to visit nearby by car and train. Shop for essentials and decent restaurant within walking distance." Fantastiskt fint typiskt italienskt hus med härlig trädgård och pool. Högt läge med fin utsikt! Vi hade en härlig vecka i huset som låg relativt nära staden Chiavari och på lagom avstånd till ex Porto Fino. Dock var vägen till huset väldigt smal och kuperad har man en större bil är det inte helt lätt. Efter att ha åkt vägen några gånger kändes det bättre.Att möta en bil är omöjligt , första sträckan är asfalterad och med bebyggelse ,svårt med möte. Sista sträckan är privat väg och därmed ska man inte möta någon annan bil. Leivi med omnejd är fantastiskt vackert och vi njöt av den fina utsikten! Huset var väldigt rent och bra städat. Härligt med poolen när vi låg stilla vid huset några dagar. Minus som sagt den svåra vägen. Annars blev vi väl mottagna av hus ägaren Marco. Vi åker gärna tillbaka till Ligurien !! We enjoyed our stay in Leivi very much. The house was clean en well equipped. We enjoyed the quiet location with magnificent view on the hills and the seaside below. Although the house is located in the mountains above Chiavari, by car downtown Chiavari can be reached in 15 minutes. The location is very suitable to discover the coast from Portofino to Cinque Terre. To get the house, lived the main road, it’s necessary to drive along a narrow winding road (sometimes steep slope) for about 800 mt.